The adult Muay Thai classes at Sitan Gym are designed with all levels in mind. You will be partnered with someone of the same level who is eager to learn just like you! Head trainer Thiago Azeredo gives personal attention to each person during every class. You will be critiqued on what you are doing right and wrong, and corrected appropriately to advance your skills. Our most popular class is the Beginner Muay Thai class, great for building or brushing up on your Muay Thai basics. We also feature an Intermediate Muay Thai class in which you can build on your basic skills and learn a higher level of technique, including sparring. The advanced fighter class and Intermediate class are held by invitation only. If Azeredo feels you are ready for the next phase, you will be invited to this competitive-level class. The kids’ classes are held at the same time as the adult classes, creating a unique environment where parents and their children (3 years and up) can train simultaneously in the sport they love. 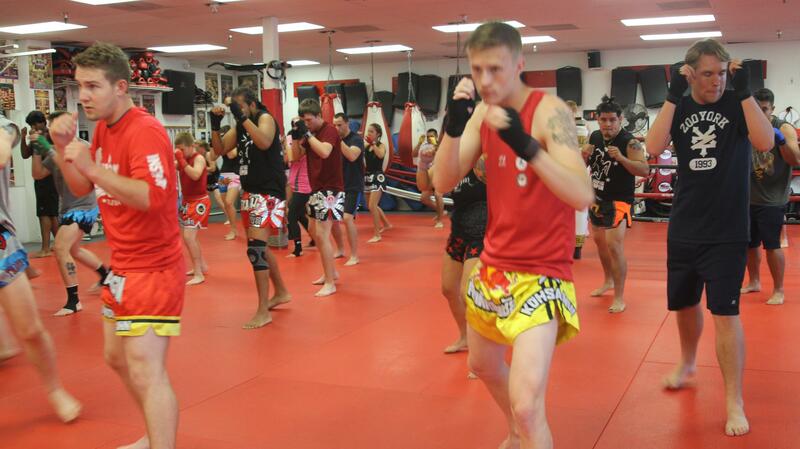 Youth classes are kept separate from the adult classes and are instructed by our top youth Muay Thai trainers. Kids of all ages have a great time doing Muay Thai while learning important life skills like respect, honor, and dedication. We have all the gear that you’ll need to begin and are free to use during class. Just wear some comfortable gym shorts and a t-shirt, and we’ll take care of the rest! The name “Sitan Gym” has a rich history of producing top-level Muay Thai fighters since its early beginnings in Europe. The same is true for the Sitan Gym Arizona training facility. Thiago Azeredo, owner of Sitan Gym Arizona, has been a martial artist from the age of 6 and has been training Muay Thai for over 17 years. Azeredo strives to bring quality Muay Thai and the art of eight limbs to every walk of life. Sitan Gym’s fighters hold over 40 titles, many of which are world-class. The gym is also known for its personal focus on each and every fighter. Sitan Gym is considered to be more of a family rather than just a Muay Thai school, providing a strong support network for all fighters as they strive to achieve their goals. Call 480-275-7820 to schedule your FREE class today and get the special attention you deserve when entering into a new art! You will be given personal focus on your first day, with basic instruction to introduce you to the sport of Muay Thai. Here is a video with some highlights from our gym!